Only very recently did i find out where my passion for audio started from. I had just moved back to the neighbourhood i grew up in, this time bringing my own family with me. We were welcomed with a nice party and someone i caught up with someone I hadn’t spoken to in ages. He told me that when i was still a small kid, he put a small speaker in a box and put it on the road in front of his house. He watched me, together with his mom, as i walked by, and used a small radio to talk through that speaker from inside the house. “Lucas… i am inside the box, come and find me!”. From what i understood i was puzzled by the little voice inside the box but intrigued. I don’t know how this story ends. To be honest, i don’t think this story has an end. I think it is still ongoing. Back then i believed there was a small creature in that box, and i kind of still believe that there could have been one in there. When i was a bit older, i started making radioshows out of the livingroom together with my friends, and making weird tape remixes by rerecording stuttering LP fragments on cassettes. I took guitar lessons for years and ‘wrote’ radioplays when i was still in elementary schools, painstakingly describing all the sound effects that should be performed during the story. But i had no idea what ‘sound design’ was. When i applied to the Utrecht School of Arts, i still didn’t really know what ‘sound design’ was. I applied for sound and music production because i wanted to write music to stories, films or otherwise. It wasn’t until the end of the second year that one of my tutors asked me a couple of questions about the function of music and found out that i really liked to bring worlds alive, to enhance storytelling. He asked me if i ever considered becoming a sound designer instead. I hadn’t, weirdly enough. But once i started to think about it, it all started to make sense. I found out i actually had a lot of fun performing foley, recording sound effects and combining random noises into something entirely different. I especially loved animation, because you get to start with nothing. No sound, it is totally up to you to make the world come alive. “Teddy” won several awards, including Best Animation Film at the Festival International du Film d’Aubange 2006 in France. 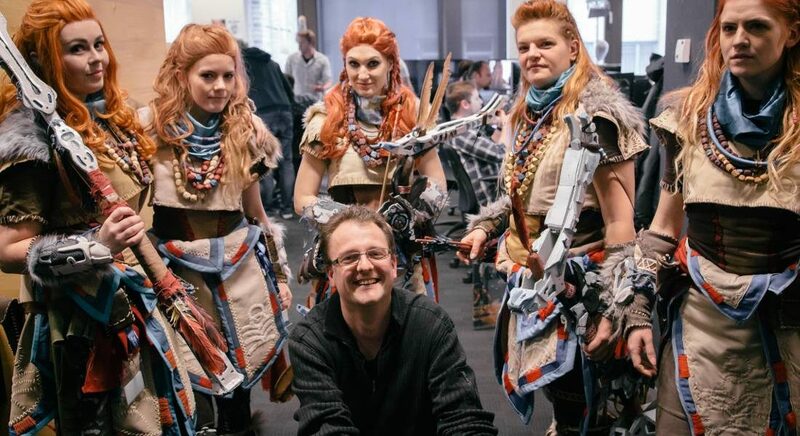 In that same year, i graduated, but not before Guerrilla Games composer Joris de Man gave a lecture at my school, talking about their new game “Killzone 2”. I, like many people, was amazed by the trailer that he had shown us and found out they were actually looking for a sound designer. Or: “Things you might not want to put on your personal website”. I always try to be an open book. So here it is. Some bits of personal story. Music and storytelling have always played a big role in my life. So in retrospect it probably isn’t that strange that i met my wife at a youth-theatre company when we were both just teenagers. We were both a bit awkward at that age, but we found each other – and a whole group of crazy friends that we see until this day. People often try to identify defining moments in their life. This moment was mine. We didn’t get together right away, it took years. There were moments we almost lost each other, but we always found each other back again. When we finally committed, she was a performing stage actress and i was busy graduating. When we got married, years later, a large group of people that we performed with at our theatre company were there to sing to us. Flash forward a couple of years. It’s december 2012 now. Our twin boys Max and Jasper are born. A bit too early, but healthy. Max remained healthy, Jasper got ill. The resulting heavy brain damage has left its marks on not only Jasper, but the whole family. There is a lot of happiness and love in our family luckily. August 4th, 2015. My daughter Laura is born. It feels like our family is complete. Fun fact: when i recorded her voice, like i did with Max and Jasper, i had no idea her voice would end up as Baby Aloy in Horizon Zero Dawn.